There are lots of ways to tell the story of Unitex – and one of those ways is through the numbers that represent our company’s history and where we are now. Here’s the story of Unitex, by the numbers. More than 90 years of business. You don’t stay in business for almost a century by cutting corners when it comes to your products and services. We’ve stayed in business by embracing change. We use the latest laundry innovations to revolutionize our laundering process, making our systems quicker and more efficient year after year. But while we’ve kept up with the times, we’ve never lost sight of our priority: our customers. 4 generations of family service. 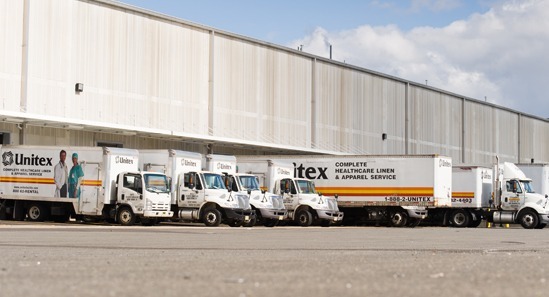 From the beginning, Unitex has been a family-owned business. Now, decades later, we are the largest family-owned healthcare laundry service provider in the nation. Our family legacy carries with it family values that we have imbued into our business practices. We take care of our clients like we take care of our family. We’ve built dedicated, state-of-the-art facilities to address the needs of our wide variety of clients. This specialization allows us to provide the best possible services for every type of laundry. We have specific facilities dedicated to healthcare bulk processing, others that focus on specialty services processing, and still more that zero in on healthcare uniform processing. Service that runs 24/7, 365 days a year. We understand that healthcare is a difficult business to predict. You’re always on and ready to help your patients, which is why we’re always ready to help you with hygienic linens and uniforms. Our facilities run around-the-clock, 365 days a year, so that we can fully service every single client at any time. Supporting healthcare facilities in 7 states. Our processing facilities service areas of New Jersey, New York, Pennsylvania, Delaware, Connecticut, Massachusetts and Rhode Island. Our detailed routes and strategic locations allow us to serve a large customer base quickly and efficiently. Out of all of our numbers, our phone number is the most important one of all. It represents the opportunity for your medical facility to finally get a service that meets all of your needs. Call us today! Our representatives are standing by to answer all of your supply questions.